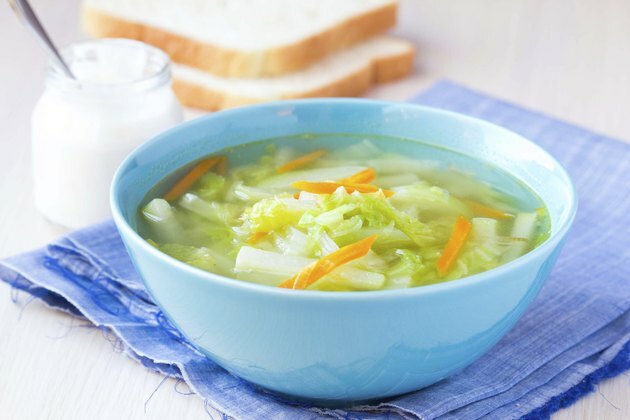 The Mayo Clinic Cabbage Soup Diet -- which has no connection at all with the actual Mayo Clinic-- is a fad diet that promises you'll lose a large amount of weight in a short period of time. Like many fad diets, this one goes by several other aliases, including the Sacred Heart Hospital Diet, the Dolly Parton Diet and the Military Cabbage Soup Diet. No one knows who actually originated the diet, which surfaces every 10 to 15 years with a new name, Diets.com reports. Like any restricted calorie diet, this diet can help you lose weight in the short term. You are supposed to follow the cabbage diet for a total of seven days, during which time your mainstay for meals is cabbage soup, which also contains bouillon, French onion soup mix, tomatoes and a few other vegetables. You're allowed as much soup as you want every day. Recipes for the soup vary, depending on the version of the diet. The first days allows soup and all the fruit you can eat, except bananas. The second day allows all the vegetables you can eat, including one baked potato and no fruit. Day three allows both fruits and vegetables, but no potato. Day four allows up to eight bananas and all the skim milk you can drink. Day five allows 10 to 20 oz. of meat and tomatoes and day six allows meat and vegetables. Day seven allows brown rice and vegetables plus unlimited unsweetened fruit juice. Since the diet lasts only seven days, it isn't likely to cause any nutritional deficiencies. It does include fruits on many days and vegetables every day, either in the soup or separately. Some versions also recommend drinking eight glasses of water each day. You can eat unlimited amounts of soup all day, which may reduce your desire to eat foods not on the diet. This diet includes a lot of cabbage, well-known for its tendency to produce intestinal gas. It might be best to do this diet on a week where you don't have too many social engagements. The soup also contains several foods high in sodium, including the bouillon cubes and the French onion soup mix. If you're on a sodium-restricted diet, don't try this diet without your doctor's approval. On most days, the diet is also low in calories and protein and very low in fat, which is a necessary part of any diet. The lack of calories, protein and fat could cause dizziness, weakness and fatigue. The cabbage diet isn't the worst fad diet to follow, since it does contain fruits and vegetables and does not include processed foods. However, following it for more than a week at a time could aggravate nutritional deficiencies, nutritional scientist Elaine Turner of the University of Florida states. For example, people with diabetes might not be able to maintain stable blood sugars on this diet, according to Turner.